When I saw Lazer Ryderz hit Kickstarter I knew I had to give it a go. And lucky for me there was a print-and-play link on the KS page. So I did what anyone would do, I printed and played. 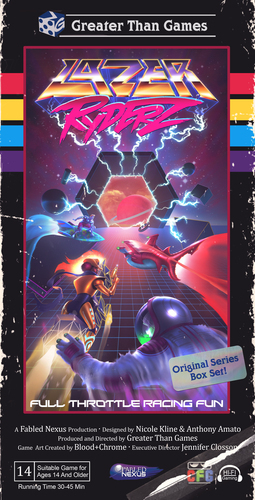 Lazer Ryderz—by Greater than Games—is a 2-4 player game that last between 30 and 60 minutes and is for ages 12 and up (I would say 8 and up would be fine). It reminds me of a crazy mash up of Star Wars X-Wing Miniatures meets Tron meets Formula D. It is straight up madness on a table!!! In Lazer Ryderz players are tying to be the first to score three goals by driving their ship through the goal tokens. To do this on a players turn he will need to decide to gear up or gear down, whether to go straight or turn, then execute the move. Going straight is easy enough but turning can be a real challenge. Not only can't a player size up the turn by laying down the template on the table a head of time, they must roll a dice to execute the turn. So there is a chance that you won't turn when you want and end up crashing into another players light path or missing a goal completely. If a player does crash he must restart at the edge of the table. Also if a player scores a goal the goal is changed to the player's color goal token (which can be stolen by another player) with the original goal token being redistributed on the table by the next player. Here is a quick silly look at a three player game. Lazer Ryderz has my attention and I will be watching to see what else is added to the game along the way.